The FireAPI™ SDK provides software developers with all the tools they need in order to develop and debug 1394 applications in the Windows environment. It is based on Unibrain’s 1394 Stack Technology (ubCore™), the next generation of innovative 1394a and 1394b driver suite for Windows 2000/XP/2003/Vista/7/8/10 and Windows NT 4.0 (via ubCore 3.30 runtime drivers only). Moreover, it is the only 1394 SDK providing a complete User Mode interface to the developer. ubCore™: Low level 1394 adapter drivers that provide the interface to all 1394a and 1394b devices. This interface can be used directly either from kernel mode client drivers or from user mode applications. The 1394 adapter drivers are bus manager and power management capable and come with a variety of specific 1394 device drivers built on top of them. User Mode Driver & DLL: The user mode DLL provides the ability to communicate with 1394 devices directly from within a user mode application bypassing the need to create a specific 1394 kernel mode client driver for each device in question which can be a tedious and difficult task to undertake. Serial Bus Manager driver: Set of functions to control bus management and isochronous resource management. Includes FULL source code. VersaPHY™ support. (Version 5.60 or later). VersaPHY is a new standard technology in the IEEE1394 family of standards that is meant to support the implementation of low cost devices, devices that don’t require a LINK chip (and usually an associated IP core) to function. You can find more details in FireAPI documentation or this presentation. FireViewer™: A 1394 bus viewer utility implemented using the user mode DLL that displays the current topology of any local 1394 bus. Includes FULL source code. FireCommander™: A 1394 command interpreter tool implemented using the user mode DLL that is used to pass commands to the 1394 stack. ubTweak™: A convenient utility which allows the developer to control various parameters of the ubCore drivers and SDK. FireNet™: 1394 native networking software. Fine tuned for 800Mbps. SBP2 Driver: 1394 SBP2 external storage device driver. IIDC 1394 Camera Driver: WDM kernel streaming camera driver. This driver provides access to IIDC cameras connected to the system through any generic third party DirectShow based application. The driver also provides WIA and TWAIN support for Microsoft Windows XP and later as well as FULL integration of the device with the operating system. 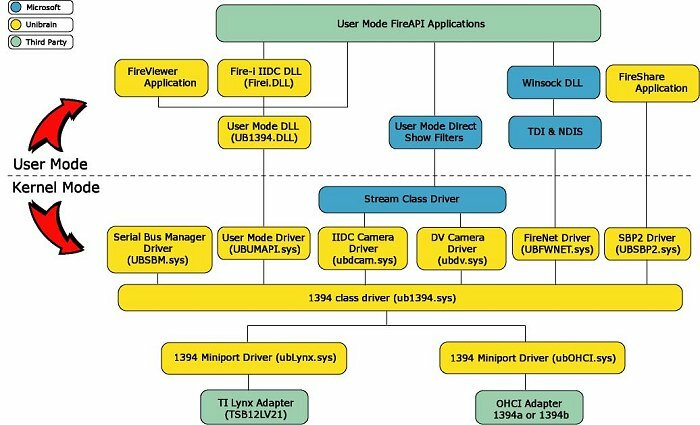 Fire-i™ application: Application ,implemented using the IIDC 1394 camera driver and DirectShow, that allows full camera enumeration, control and preview. Fire-i™ DLL: User mode C style DLL that directly communicates with the 1394 adapter drivers and provides a simple and robust interface that allows full control and preview of IIDC 1394 digital cameras connected to the adapter. The FULL source code of this DLL as well as source samples and accompanying documentation is provided with FireAPI™. Fire-i IIDC application: New camera control and diagnostics application, based on the Fire-i DLL. The FireAPI™ Development Toolkit provides the entry point to develop, test and debug your specific 1394 application. An extensive collection of prepared functions and a dedicated access to Unibrain’s support are included and will speed up your development. Unibrain’s or any third party 1394a or 1394b OHCI PCI/PCMCIA/PCI Express/ExpressCard compliant adapter, or any Desktop/Portable PC with built-in 1394a or 1394b OHCI support. 1709: FireAPI™ software license (activation product key, required one per firewire adapter). 1705: Fireboard-Blue™ 1394a PCI adapter with built-in FireAPI™ hardware license. 1711: FireboardBlue-e™ 1394a PCI Express adapter with built-in FireAPI™ hardware license. 1721: Fireboard-800 V2™ 1394b 64 bit PCI adapter with built-in FireAPI™ hardware license. 1719: Fireboard800-e V2™ 1394b PCI express dapter with built-in FireAPI™ hardware license. 1722: Fireboard800-e Pro™ 1394b Dual bus PCI express dapter with built-in FireAPI™ hardware license. 1703: Fireboard-400™ PCI Lynx-2 1394a PCI adapter with built-in FireAPI™ hardware license. Minor update which incorporates the ubCore 5.80 version drivers and fixes issues with new multicore, multiprocessor systems. Minor update which bundles the ubCore 5.62 version drivers and adds support for Windows 7. Bundles latest release (5.60) of ubCore drivers. Signed drivers, version 5.50, for Windows Vista 32 and 64 bit editions. Added: Software DMA channel multiplexing at the driver level, completely transparent to user mode. Added: Maximum 64 adapters supported by all drivers in ubCore. Added: UBUMAPI driver – Increased I/O completion priority boost. Added: Class Driver – Dynamically configurable Minimum Bus Reset Interval. Added: UBUI.DLL – Format selection dialog to indicate bandwidth usage of each format of IIDC cameras. Added many new features and functionality in FireCommander and FireViewer tools. Signed drivers, version 5.13, for Windows Vista 32 and 64 bit editions. 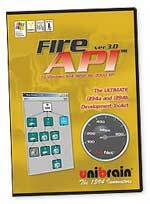 Added: Unibrain cameras do not require a license for firei.dll/ubCore. Added: New ISO receive method for image capture in firei.dll. Added: DMA error code mapping. Update release which includes all latest driver runtimes. Added support for Windows Vista. Important bug fixes and driver performance improvements. Added ability to disable Plug & Play for certain devices. SBM now uses Short Bus Resets by default instead of Long Bus Resets. Updated SBP2, Firenet (networking), IIDC camera drivers. Added: C1394ReadPHYRegister() function for kernel and user mode. Added: Block reads in Configuration ROM as the 1394a-2000 spec. requires. Added: SBM and SPLIT_TIMEOUT management. PHY, max_ROM, max_rec commands have been added to the FireCommander. Full Winodws Plug & Play support. Easy switch between Unibrain and Microsoft driver via a single click (“ubswitch” application). Added support for Windows Power Management. Added support for Windows 2003 Server Operating System. Added support for Windows XP 64 bit (AMD Athlon 64 and Intel EM64t). Added IIDC 1394 cameras DirectShow WDM compliant driver and control application (full source code provided). Added support for 1394b (Firewire-800) IIDC cameras. Added support for DV/61883 driver. Added support for 1394b (Firewire-800). Added support for SBP2 interface. Added support for FireBoard Blue™. Added support for FireBoard 800™. Added support for PCMCIA OHCI cards. Added support for optical cables and repeaters. Added support for Windows XP. Added support for 3rd party OHCI cards. Added support for FireBoard400-OHCI card. Added support for Windows Me. Support FireBoard-400 Lynx-2 PCI adapter. Any application developed with FireAPI™ or Fire-i API™ or Fire-i X™ SDK requires a license of the runtime drivers and redistributable software. Unibrain offers a variety of licensing options and customers can chose the one that is most applicable for their system. (a) Software licensing: Software licenses are in the form of product keys which activate the drivers per camera or per firewire adapter (customer choice). The GUID (Globally Unique Identifier) of the device must be provided to Unibrain and then we will return to the customer the activation code. A separate product key is required for each 1394 adapter (or 1394 camera) that has the ubCore or Fire-i drivers installed. 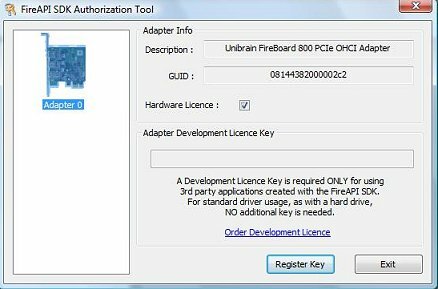 (b) Hardware licensing: Hardware licenses are in the form of special versions of Unibrain’s PCI or PCI express firewire adapters, which embed a license. Applications running on top of those adapters will be fully functional and no product keys are required. 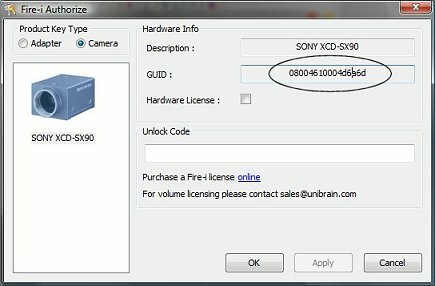 Any device (including IIDC firewire cameras) that is connected on a Unibrain licensed adapter will also operate in licensed model. Software or hardware licenses can be purchased online or by contacting Unibrain and its distributors or resellers. Volume license discounts apply and special OEM programs are also available. For more information please contact us at: sales@unibrain.com.